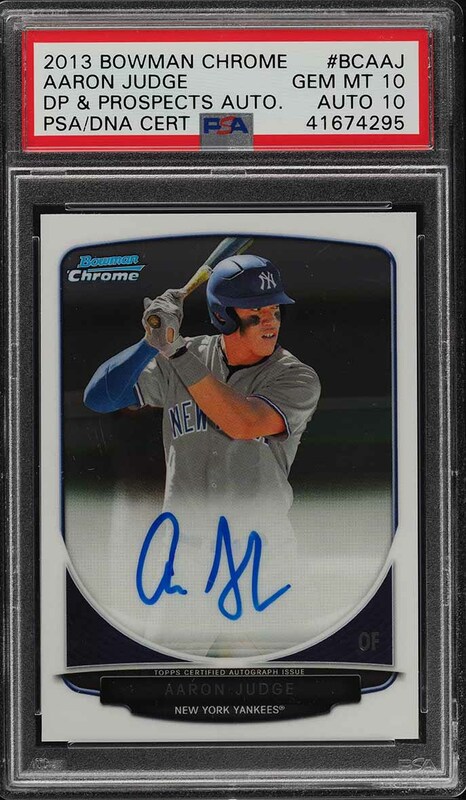 Simply put, this is just an incredible Aaron Judge rookie card which possesses the hotly desired dual PSA 10 assessment. Exhibits beautiful white borders with smooth edges and rock-solid corners. Shows glossy surfaces with perfect print and registration. The autograph is penned in blue ink and is assessed as GEM MINT by PSA/DNA. A key modern rookie card of one of the games most dangerous HR hitters. Deserving of serious attention. One of nearly 15,000 cards, lots, and sets up for bid in our 4th Auction of 2019. Click on the link above to view the other PWCC auction lots. The PWCC Vault is now live! Open a PWCC Vault account and receive a custom Vault shipping address. Purchases shipped to the Vault receive free shipping and reflect Oregon's 0% sales tax rate.